A solid social media marketing plan needs an equally amazing content strategy to support it, and you may find yourself overwhelmed trying to make it happen. Creating and publishing quality and engaging content can be a lot of work day after day. As a business, especially a small one, it can be tough juggling everything, wearing a million hats, and keeping up with all the details and deadlines. However, the task will seem less daunting when there is a set calendar and plan in place, and easy options to schedule, assign tasks, and review analytics. That’s where Anvil comes in. We manage businesses from small to large, and as your followers grow, it becomes increasingly more important to have consistency with outbound content. To make sure that your messaging remains consistent, we use tools that schedule and host all of your accounts in one place, like Hootsuite, Buffer, or SproutSocial. Each one of these has pros and cons, and which one is right for your business really depends on individual client needs and the agency staff in place. The nice thing about them is they give you analytics to help you understand how well you are performing. Planning scheduled content on social media will help solve poorly timed or researched posts, yet still allows for flexibility and opportunities for real-time engagement. What’s the point in creating something amazing if no one is going to see it or engage with it? Creating a plan, a template, or a calendar simply means that you make all the necessary information available to all the relevant stakeholders in one place. It takes in all your channels and resources and organizes them in a way that makes it easy to access information you need when you need it. However, a social media campaign demands consistency and effort from all parties- client and agency both. We want to help you do well; it’s that simple. An editorial calendar with PR and marketing deadlines helps keep your brand organized, and lets us do our job more efficiently and accurately as it contains a deadline, image/video links, target keywords from SEO and paid team, the channel, call to action, and status. Want ROI? If your goal is to generate sales or leads through social media or your website, then it’s important to track where they are coming from, and include trackable links in your calendar. Setting up conversion trackers or custom bit.ly links are just two examples, and we can assist with all of this. Same goes for content. If you’re only pushing your own branded content, and not a solid mix of non-branded (media, consumer-generated, educational, etc.) you’re unlikely to drive much engagement. The same is true if you’re only publishing one type of content. This is why you need a social media content strategy to ensure you’re sending a balanced content mix. 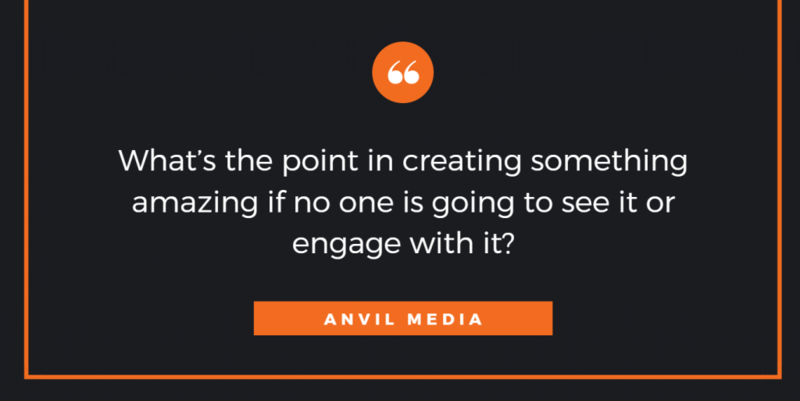 Anvil works to maximize brand awareness, while also growing a brand’s audience utilizing UGC and curated content. It’s important to test posting times and frequency. When we kick off an engagement with a new client that wants help with social, we determine what the best times and what type of content to post before proceeding to launch a campaign. Some types of messaging may resonate better at different times of the week. Your audience might be more active at different times of the day. Use the post frequency recommendations given by your agency. Agencies like Anvil, have access to many key research tools to find out the right times and days for each channel and brand. In conclusion, a social media calendar can help you consistently promote high-quality and engaging content, cut down on the amount of time you waste, and organize and curate content much more efficiently. Contact Anvil today to help your efforts!